A few weeks ago, Tara and I had the pleasure of meeting Melanie Swanson, a cycle tourist from Washington on a one-year, 'round-the-world bicycle tour. 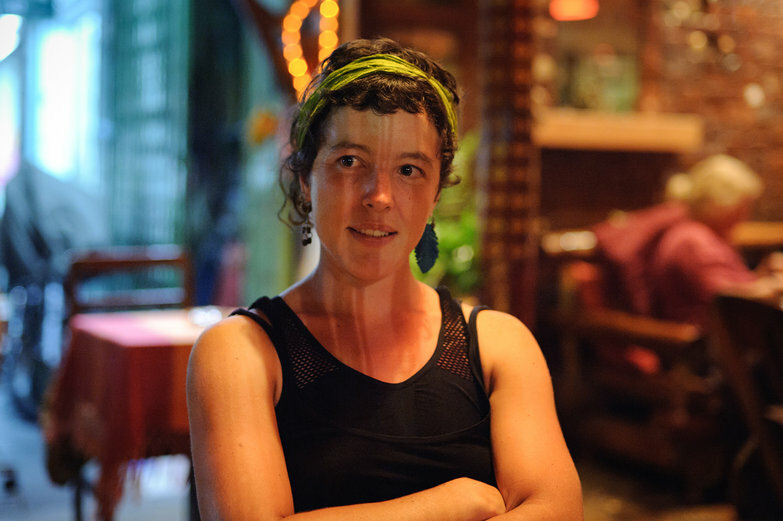 When we met in the lobby of our guesthouse, she had just completed a loop of Southeast Asia, during which she had hand-written a memoir about her experiences. 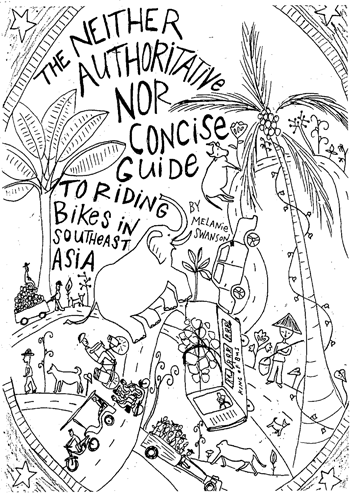 To our delight, Melanie was kind enough to give us a photocopy of her short, quirky work, which she has entitled "The Neither Authoritative Nor Concise Guide to Riding Bikes in Southeast Asia." We read the book all in one go, snickering at Melanie's dry humor and illustrations the whole way through. Her tips, stories, and country-by-country guides were so hilariously accurate that we found ourselves nodding our heads up and down in agreement the entire time. I wanted to share Melanie's brilliant piece with our friends, family, and the cycling community, so I asked the self-described luddite author if she would object to my turning it into an eBook. I was thrilled when she agreed! Last week, I had our copy scanned at a nearby Bangkok print shop, and set about turning it into a eReader-compatible PDF. The resulting eBook can be downloaded below. The PDF works fairly well on a Kindle (or similar), but it is probably best viewed on a computer, or even better: printed out. If you enjoy the book, please consider donating a few dollars to Melanie using the button below (our idea, not hers!). Melanie doesn't have a working paypal account just yet, but we'll snail-mail any donations to her until she does! We caught up with Melanie a few weeks later while she was cycling in France, keen to ask her a few questions about herself, her journey, and what it was like to write a book on the road. Can you tell us a little about yourself and your bicycle tour? I am usually fairly verbose, but I'm typing from a French computer—I'm obliged to keep my answer short due to the confusing keyboard! I am 28 years of age, and quickly approaching the usual late 20's Existential Crisis. In order to make myself appear productive, I decided to travel around the world by bicycle between September 2010 and September 2011. When I'm not riding, I enjoy working on bicycles, baking bread, building things, gardening, thinking about places I might ride my bike in the future, and contemplating how I will become wealthy so that I may one day buy a farm. If anyone wants to give me hundreds of thousands of dollars for this endeavor, please do not hesitate to contact me! Entertainment for myself when we found ourselves in dusty tiny towns with nothing more than a few chickens and a dingy guesthouse. Also because I wanted to convey information—the book is sort of a joke, but I actually hope that it could be useful to some degree, or at least inspiring on some level. How did you carry it, and where did you write? I kept it in a plastic bag in my pannier; it got pretty beat up. I wrote most of it in my head as I rode, and often had to stop to jot down ideas before I forgot them. Our last month of riding I wrote and drew whenever we were stopped. I was not the most entertaining travel companion. Keep an eye out for upcoming publications, one entitled "A Tiny Book All About Riding Bicycles in a Tiny Part of Europe" (currently being written) and also; "How to ride Bicycles Across the United States With Your Sister: An Indispensable Guide." This will be a collaborative effort with my little sister, who is a much better artist than I am—the illustrations will be far nicer. I do have a vague dream of one day making a real (I don't know exactly what I mean by 'real') bicycle travel guide but then again, I have many dreams. Since you like travel, gardening and adventures have you looked into WWOOFing? I can´t find a link to download the book... I´d love to download it! thanks! There is a picture of a book with a big green arrow facing downwards in two places on this entry. If you click that, it'll download the book. I'll add a text link as well in a little bit. I only got as far as page 5 before I had to come back and donate a bit. Thank you so much! Most awesome. Honestly, I read the whole freaking thing and its the funniest and most helpful guide I've ever read for cycling in SE Asia. Hi, listen, I'm pretty new on this blogosphere and Internet thing, so I don't know if there's a sort of "subscription" method that I can use levitra cialis in order to receive notifications of your new entries...? Thing is I enjoy reading your blog a lot and I'd like to be up to date with your posts! Hi Melanie, very nice story of your epic journey cycling around the world. Hope you will always happy n safe.